You move to San Diego because you want consistently lukewarm, sunny weather. Florida is balmy much of the year, but a miserable sauna during the summer. Arizona? A fine choice, if you don't mind living in a DESERT. Minnesota? We're relieved if the mosquitoes are small, if the hail is only pea-size or less - and December temperatures reach freezing. Yesterday, with bright sun, light winds and mid-30s it felt pretty good out there. Admit it. 2016 was the wettest year on record for the Twin Cities. Accurate, reliable data goes back to 1871. Every month was milder than average, and in spite of -20F a few Sundays ago this month should be no exception. We end 2016 on a relatively mild note, with 30s into Monday. But no drama is brewing for New Year's weekend festivities. It can always be worse. Trust me. New Year's Eve Map. The map above shows 12 KM NAM guidance valid 7 PM Saturday evening. Rain is likely over the Mid South and Ohio River Valley with a little wet snow for Columbus, Cleveland and Buffalo. More heavy showers push across southern California with a rain/snow mix pushing ashore over Washington State. Otherwise the weather looks quiet and seasonably chilly Saturday night. Snowfall Into Saturday Evening. Lake effect snows will kick in, but the heaviest amounts fall over interior New England as a rapidly strengthening Nor'easter pulls moisture inland. No heavy snow for major east coast city centers - not yet. Map: NOAA. Wild Winds. Air accelerating into the center of a low pressure "bomb" off the coast of Maine will reach speeds as high as 60 mph - I wouldn't be surprised to hear reports of power outages along the coast. Montana also experiences near-hurricane force winds over the next 48 hours. 10-Day Snowfall Forecast. This is GFS data, showing the heavy snow falling on interior New England today (Boston may see wind gusts over 50 mph); lake effect downwind of the Great Lakes, and more heavy snow from the Pacific Northwest into the highest peaks of the Rockies. 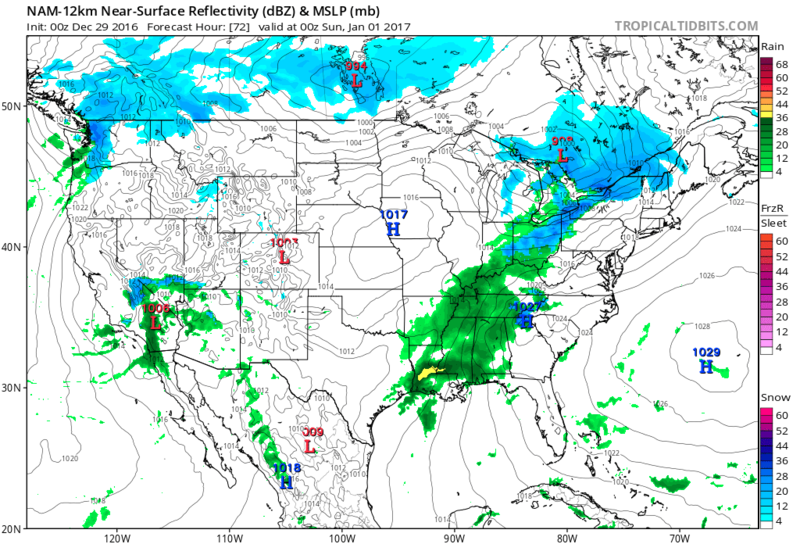 Accumulating snow for San Antonio, Texas by January 5-6? At this point I wouldn't rule anything out. Source: Tropicaltidbits.com. Temperature Correction Next Week. Keep in mind the average high now is 24F, so temperatures run a good 5-10F warmer than average into early next week, before dropping off by midweek. I think our January Thaw came early this year. ECMWF numbers for the Twin Cities: WeatherBell. Partly Nippy. Temperatures trend a few degrees above average into Monday, and then the mercury drops about 30-40 degrees by Thursday morning. Not even close to record-territory, but cold enough. Graphic: Aeris Enterprise. One Week From Today. Although not as harsh as December 18, when the Twin Cities woke up to -20F, temperatures will be very January-like the latter half of next week with subzero lows for the northern Plains and Upper Mississippi Valley. 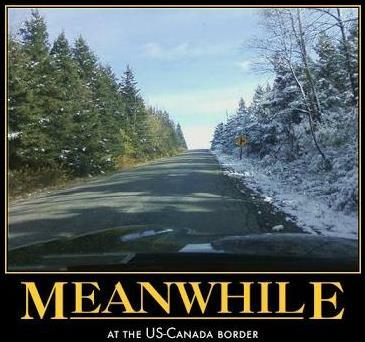 The rest of the USA: chilly, but certainly not ridiculously cold. Ask your doctor if any medicine you're taking increases your risk of hypothermia. Drugs that may cause a problem include barbiturates, benzodiazepines, chlorpromazine, reserpine, and tricyclic antidepressants..."
The Dogs of Winter May Start Howling Again Soon. 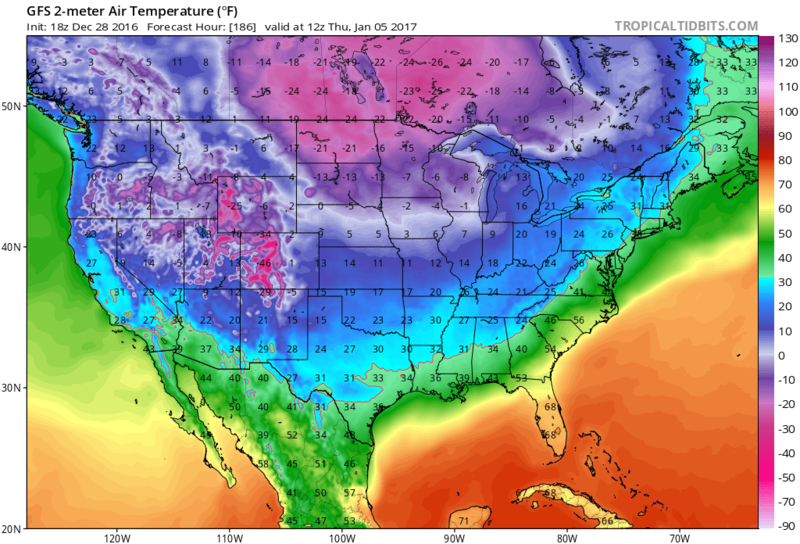 I happen to agree with meteorologist Dan Satterfield; here's an excerpt of a solid blog post at AGU Blogosphere: "There are growing signs that Arctic air may return to the U.S. by late next week as the mild weather pattern of the last ten days begins to fall apart. There is still a lot of uncertainty about whether or not this pattern will lock in or if this will be just a temporary blast of cold before milder Pacific air takes back over. The big clue to these changes is the temperatures in Alaska and Greenland. It’s been quite cold over Alaska over the past two weeks, but the long-range NOAA and Euro models show a strong ridge of high pressure in the upper troposphere building back over the area later next week. This will turn winds aloft over Canada back to the north and steer an Arctic air mass southward. High pressure aloft will also build back over Greenland and this is where we look for some cold and snowy winter weather in the Northeastern U.S. The pressure pattern called the North Atlantic Oscillation (NAO) is heavily dependent on Greenland pressure, and when the pressures go up, the NAO goes into what forecasters call the negative phase..."
Map credit: "This is the NOAA GFS Ensemble. It’s an average of many model runs, and the ECMWF Model run in the UK is also showing much the same. This adds confidence to the forecast. Note the rising pressures over Greenland as well. This would correspond to a slight negative in the NAO." Good News on a Depressing Topic. So maybe SAD (Seasonal Affective Disorder) isn't "settled science"? Is it all in our heads? Here's an except of an interesting story at The Buffalo News: "...A recent study in the Journal of Clinical Psychological Science, if it continues to stand up to peer review, essentially debunks SAD as a real condition. Scientific American magazine outlines some of the study’s findings and other evidence. The investigators in the study did not initially question the acceptance of SAD as a real condition, and they did expect to find a correlation of more occurrences at higher latitudes. In other words, they went in to their work expecting to learn more about SAD, rather than to raise questions about its validity. Instead, what they and the Centers for Disease Control and Prevention found (the CDC had done a large, detailed phone survey) was quite to the contrary of what had been widely accepted for three decades..."
Study Finds Seasonal Affective Disorder Doesn't Exist. Here's a summary of recent research at Scientific American. Photo credit above: Steve Burns. 2016: Fewest U.S. Tornado Deaths in 30 Years. No mega-outbreaks this year, so there was some good news in the weather department. Here's an excerpt from USA TODAY: "From floods to wildfires, 2016 featured several weather disasters, but a big, deadly tornado outbreak was not one of them. Tornadoes killed only 17 Americans this year, the fewest in 30 years and the second fewest since accurate records began in 1950. In 1986, 15 died, which is the least on record, according to the Storm Prediction Center. (Unofficial records from before 1950 show only one other year with so few deaths: 1910, with 12.) The number of tornadoes was also well below average this year: 901 reported through Dec. 27. 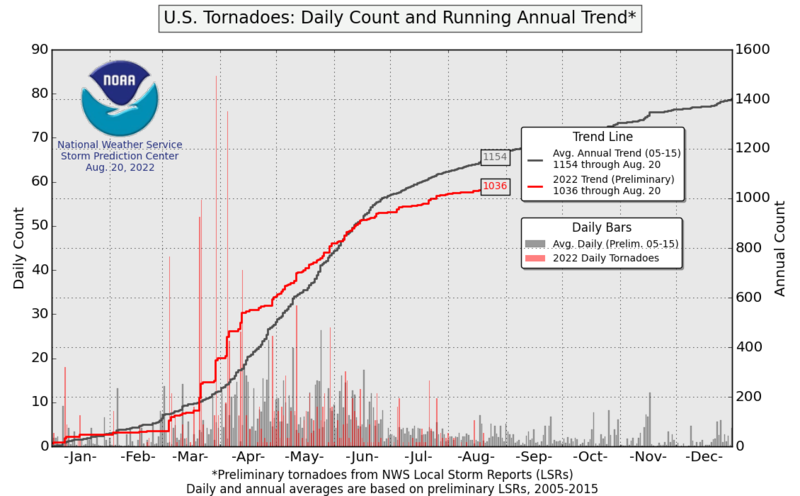 An average year sees 1,061 tornadoes, according to data from the prediction center. This made it the third-quietest year in the past 10 years..."
Map credit: 1059 preliminary tornadoes in 2016, according to NOAA SPC. Severe Thunderstorms Down Under. Check out a severe thunderstorm warning; a 60 minutes "Nowcast" issued for Melbourne, Australia, last night. The graphics come from the Australia Bureau of Meteorology. Year of the Flood: The Nation's 10 Most Extreme Weather Events of 2016. Jason Samenow reports at The Capital Weather Gang: "In 2016, of all the weather events to affect the nation, four stood out: a hurricane, a flood, a drought and a blizzard. These four were historic and extreme, setting numerous records and affecting large areas. Unfortunately, they caused a great deal of suffering and economic losses. Six other storm events, which were more localized, round out the top 10. Tornadoes were not among this year’s most significant weather events. This year was, generally, a quiet year both in terms of the overall number of tornadoes and tornado fatalities. Much more than wind, in 2016, water (or, in one case, lack of water) caused the lion’s share of weather-related deaths and damages. As seven of the top 10 weather events involved extreme rainfall, and several 1-in-1,000 year events, perhaps you could call it the year of the flood..."
The Top 9 U.S. Weather or Climate Events of 2016. Meteorologist Marshall Shepherd has a good overview of another manic year of weather at Forbes: "Like any year, 2016 was characterized by a range of weather-climate events in the United States. On its website, NOAA's National Center for Environmental Indicators tallied 12 weather or climate related disasters with economic losses greater than $1 billion in the United States as of September. Flooding (4 events) made up most of the list. WBAL weather anchor Miri Marshall, reflecting on the Ellicott City, Maryland floods said, "I have never seen rainfall rates like this in my career and I've forecasted in Texas." It was certainly a "wow" moment in weather to see more than 3" of rain in roughly 30 minutes." There were a lot of "wow" moments, and since the NOAA analysis is only through September, it doesn't even include Hurricane Matthew..."
Doppler radar loop: Hurricane Matthew on October 6, 2016. 4 Ways To Become a Weather Forecast From Your Backyard. Crowdsourcing of weather information is becoming increasingly valuable - consider becoming a professional SKYWARN observer too. Here's an excerpt from Mental Floss: "...If you’ve ever heard reports of severe weather on the news talking about a “trained spotter,” they’re talking about one of the hundreds of thousands of volunteers who have participated in official storm spotter training. SKYWARN is the official weather spotter training program run by the National Weather Service (NWS). The program is a short, free course run by local NWS offices several times every year. It teaches you the basics of spotting severe and hazardous weather, and properly reporting that weather back to the NWS. SKYWARN spotters are a critical part of the early warning system in the United States. Accurate reports of tornadoes, damaging winds, hail, and flooding sent to the NWS by trained storm spotters have helped meteorologists issue severe weather warnings with enough time to save lives..."
A Celebration of Clouds: From Space, Earth Has an Elegant Atmosphere. Here's an excerpt of a good read at NASA's Earth Observatory: "Earth has been referred to as "the blue planet” due to its abundance of water. "The cloudy planet” would be equally appropriate. At any given time, about two-thirds of Earth’s surface is covered by these masses of water and ice particles suspended in the atmosphere. Clouds can be a nuisance for scientists trying to use satellites to observe features on the surface—such as volcanic eruptions, floods, or phytoplankton blooms. But for some scientists, clouds are exactly what they want to see. Clouds help make the weather and affect Earth’s climate, and they can make a difference in the success or failure of efforts to simulate both. (Correctly representing clouds in climate models, it turns out, is really hard to do). But sometimes, clouds manifest in such a way that they simply inspire awe..."
Up In The Air: Meet the Man Who Flies Around the World For Free. Fascinating, and on some level, a bit sad. What kind of life is this? I like to fly, but this sounds like aviation purgatory. Here's an excerpt from RollingStone: "...One of the fundamental steps a Hobbyist can take is choosing an airline to compete for top-tier loyalty status; Schlappig chose United. Nothing was free up front — the object of the game was a return on investment. A Hobbyist doesn't spend unless he can get the same or greater value in return. It took Schlappig about a year to master the dozens of convoluted techniques, exploiting mistakes in ticketing algorithms and learning the ins and outs of the frequent-flyer programs airlines had created after deregulation in the late 1970s. The second leg of the game is credit cards — collecting and canceling as many as possible, and deploying a series of tricks to reap the reward points that bank-and-airline-card partnerships would virtually give away. As he delved deeper, Schlappig learned about a third level, a closely guarded practice called Manufacture Spend, where Hobbyists harness the power of the multitudes of credit cards in their pockets..."
Photo credit: "Ben Schlappig is a master of flying around the world — at no cost to himself." Bryan Derballa. 24 F. average high on December 28. 23 F. high on December 28, 2015. 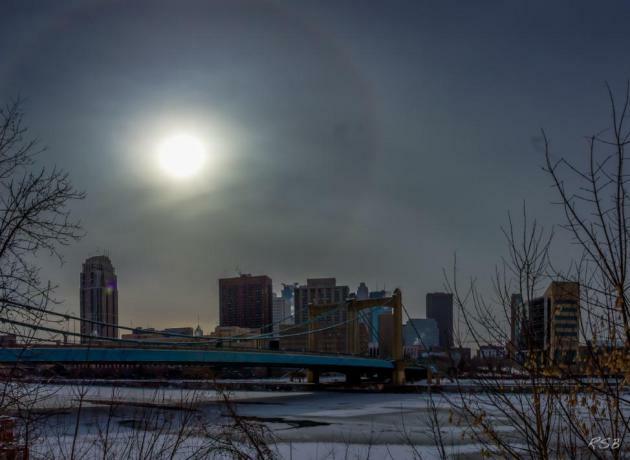 December 29, 1999: Minneapolis soars to a high temperature of 53 degrees. How Climate Change Transformed the Earth in 2016. 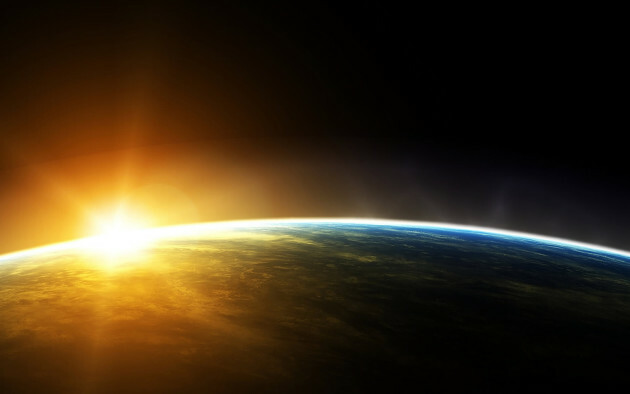 Here's an excerpt of a good recap from CBS News: "...In the centuries to come, history books will likely look back on September 2016 as a major milestone for the world’s climate,” Brian Kahn of Climate Central wrote earlier this year. That’s because, during September, a month in which atmospheric carbon dioxide — a heat-trapping greenhouse gas —is usually at its lowest, the monthly value failed to drop below 400 parts per million. The 400 ppm mark has sad significance in the climate community, as it has long been considered a point of no return for the atmosphere by scientists. This year is poised to be the hottest year in the 137-year official record, with global temperatures climbing even higher than record-breaking 2015, according to data released in November from the World Meteorological Organization (WMO)..."
Yes, the Arctic's Freakishly Warm Winter Is Due to Humans' Climate Influence. Here's an excerpt of an article that caught my eye at The Conversation: "...To put it simply, the record November-December temperatures in the Arctic do not happen in the simulations that leave out human-driven climate factors. In fact, even with human effects included, the models suggest that this Arctic hot spell is a 1-in-200-year event. So this is a freak event even by the standards of today’s world, which humans have warmed by roughly 1℃ on average since pre-industrial times. But in the future, as we continue to emit greenhouse gases and further warm the planet, events like this won’t be freaks any more. If we do not reduce our greenhouse gas emissions, we estimate that by the late 2040s this event will occur on average once every two years..."
2016's Super Warm Arctic Winter "Extremely Unlikely" Without Climate Change, Scientists Say. Chris Mooney provides more perspective at The Washington Post: "...Clearly this is abnormal. But how abnormal? The answer is that what has happened this year in the Arctic, and particularly the high Arctic, appears to be not only out of the norm for a stable climate — like the one on Earth before the era of fossil fuels — but also for what you might expect from our supercharged, artificially warmed climate. Such is the upshot of a recently published “detection and attribution” analysis of November’s and December’s Arctic warmth by a group of scientists who are not waiting around for the peer review process — they are increasingly releasing these documents in near real time. And they find that “it is extremely unlikely that this event would occur in the absence of human-induced climate change.” The analysis was conducted by a World Weather Attribution, a consortium of researchers who are perfecting the study of how a changing climate affects local weather conditions, or conditions in a specific place..."
Global Warming 2016: Arctic Spin. Here's an excerpt of a long post on worrying trends at the top of the world: "...Nobody who knows Arctic sea ice was surprised by this. It has been on the decline, overall, for decades, so it’s no surprise that this year’s levels would be at or near their lowest. It’s part and parcel of the ongoing trend of the loss of sea ice in the Arctic. Nor was it a surprise that, even with an ongoing trend, it wasn’t always at its lowest-ever. 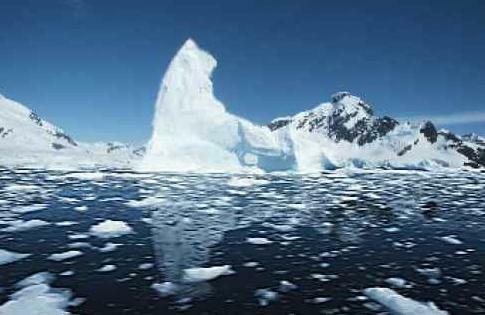 Most everything in nature, including sea ice, doesn’t just follow a trend, it also constantly fluctuates. Added to the overall tendency, there are ups and downs and downs and ups that make it different from day to day, month to month, even year to year. But over the long haul, the fluctuations — even though they never stop — never really get anywhere. What does, what keeps on going and accumulates until we can’t ignore it any more, is the trend — and for sea ice in the Arctic, that means there’s less and less of it..."
Photographing Climate Change Refugees, by Drone and On Foot. Here's an excerpt from The New York Times: "...We didn’t really know if climate refugees or migrants existed yet or if this was something that was still far afield. We reached out to reporters in our foreign bureaus all over the world and asked them to start to look into this topic and see if there were climate-based migrations or relocations happening right now. After a month or two of preliminary reporting, we decided that there were enough stories to justify a concerted effort to look at climate refugees all over the world..."
What a Record-Breaking Year! Sigh. Grist has the details; here's a snippet: "The Arctic is getting really hot. Alaska saw its hottest year ever, with temperatures an average of 6 degrees F above normal. Arctic sea ice cover took a nosedive to a new low this fall, as temperatures at the North Pole reached an insane seasonal high nearly 50 degrees above average. Reminder: There is no sun in the Arctic in December. The first year we spent entirely above 400 ppm. After the biggest monthly jump in atmospheric CO2 levels from February 2015 to February 2016, those levels stayed high for all of 2016..."
Global Warming is Reshaping the Wine-Making World. Here's an excerpt of an interesting interview at New Hampshire Public Radio: "...We all know that wine comes from special places, places where the rainfall falls in winter and you have relatively cool summers. And as those places heat up, they're going to become less suitable for the types of grapes that are currently grown there. And then some other places are going to become more suitable. So places like Tasmania and Denmark even are now becoming more suitable for growing wine grapes..."
The Navy Adapts to Rising Sea Levels. Here's an excerpt from Marketplace: "...Base officials said they are planning a redesign, using a combination of retiring some buildings, expanding wetlands and dunes, and installing hard protections like seawalls where necessary. “Those are things that we're going to look at very closely and try to make those wise decisions, because they are they are expensive decisions, and we want to make the right decisions, so we have the right facilities in the right place,” said Diane Legere-Jump, facilities management division director for public works at Naval Base Ventura County..."
Photo credit: "Waves crash over a sea wall at Naval Base Ventura County." Courtesy of Naval Base Ventura County.